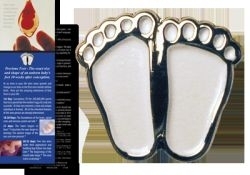 This Precious Feet Pin is available in a black-nickel finish with a white fill inside the raised edge. It offers a beautiful way to wear & display your Right to Life beliefs! The feet are the size of a baby's feet 10 weeks after conception. 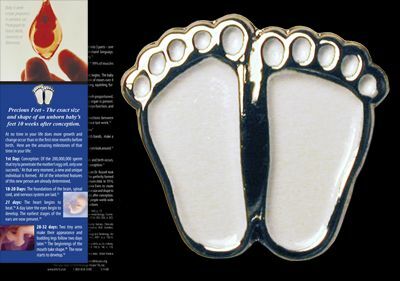 This Pro Life Pin comes pinned on an informational bookmark that lists developmental moments in an unborn baby's life. Size: Approx. 3/8" x 3/8"
Includes informational bookmark with the baby's developmental stages before birth.